The best food dehydrator jerky can be a great on-the-go snack. These two Paleo jerky recipes are my favorites because they do not have any added sugars or questionable ingredients that you can find in a lot of homemade beef jerky recipes. Freeze meat for about 2 hours until it is almost frozen but still able to be cut with a knife. Mix the coconut aminos with the pepper and minced garlic in a bowl. Toss sliced steak with the coconut aminos mixture. Marinate jerky overnight (wait 24 hours if you can) in refrigerator. Closely monitor meat to make sure it looks done but it doesn’t dry out too much. If you didn’t keep the thickness consistent, some pieces may need to be removed before the rest is done. This will product about 2-3 pounds of delicious jerky. Marinate jerky overnight in refrigerator. If you didn’t keep a uniform thickness, some pieces may need to be removed before the rest is done so watch closely. 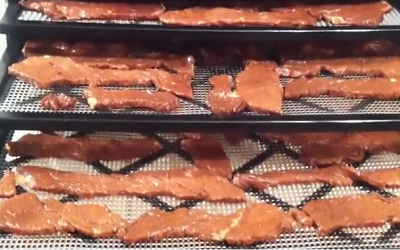 This will product about 2-3 pounds of yummy Paleo BBQ jerky. Note: Some people think it makes the best food dehydrator jerky if they add a little (like this all-natural one) to the marinade. 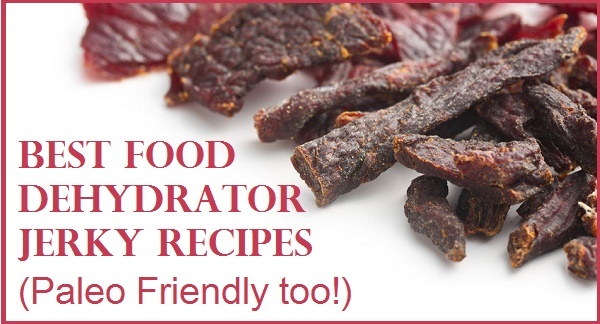 Try it both ways and see which dehydrator jerky recipe variation that you like best.